Most of us are no stranger to a little bit of fatigue now and then, a few pounds we wouldn’t mind losing, the occasional irregular period, or blue mood. But if you are struggling with any of these on a regular basis, with some severity, or a cluster of these symptoms, your thyroid function may be the culprit. Your thyroid gland is the thermostat regulating the energy for your entire body. It controls everything from your mood to your menstrual cycles to your metabolism — and about a thousand other biological functions — including how efficiently you burn calories and how easily you lose weight. The thyroid gland is shaped like a butterfly and is located in the front center of your neck, about midway between the under part of your chin and that lovely dip at the base of your neck. Through a series of chemical reactions, the thyroid gland takes iodine and repurposes it into fuel for numerous important functions throughout your entire body. This fuel starts out mostly in the form of the inactive hormone Free T4 which is then supposed to be converted as needed into the active form of the hormone called Free T3 — which does the heavy lifting! And autoimmune forms of under- and over- active thyroid (Hashimoto’s and Graves disease, respectively) or due to other causes ranging from nutritional deficiencies to infection and inflammation (thyroiditis). 1. Having the right amount of thyroid hormone for your individual needs is essential to your well-being.Without enough you might experience fatigue, constipation, dry skin, brain fog or trouble concentrating, depression, anxiety, hair loss, depression, joint and muscle aches (even carpal tunnel syndrome and tendonitis! ), generalized swelling, cold intolerance (or you always feel a little cold) dry skin, even an excessively low heart rate. If you have an overactive thyroid, you might experience a rapid heartbeat, anxiety, insomnia, insatiable appetite, diarrhea, and weight loss. (1) If you think you have a thyroid problem, it’s okay to be a squeaky wheel to your doctor. Squeaky wheels get the testing they need! 2. Women are way more likely than men to develop thyroid problems, and the months after birth are an especially high risk time for thyroid problems to surface. (4) If you feel unusually blue in the year after the birth of your baby, or at any time, and especially if you have any of the above symptoms, get tested for thyroid problems! 3. Your high cholesterol could be caused by an underactive thyroid. Say what? Yes, it’s true. Hypothyroidism can lead to high cholesterol because slower metabolism isn’t burning up your fat. So before you go on special diet or a statin drug to control your cholesterol — get your thyroid levels checked. 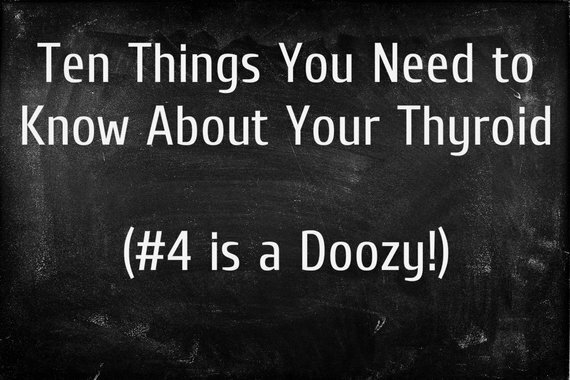 The answer might be in finding the root cause — a thyroid problem! 4. Most doctors UNDER-DIAGNOSE thyroid problems! (3) Thyroid problems may affect as many as 10 percent of women — but for many of these women, the labs tests that doctors currently use, and the way those tests are interpreted, leads many women to be told that they don’t have a thyroid problem, and in fact, they are just fine. (5) [TRANSLATES AS: This is all in your head because I, with my medical degree, cannot find a darned thing wrong with you, lady.] And this often results in an antidepressant prescription. 5. Hypothyroidism can be causing your fertility problems and also increases miscarriage risk. (6) Thyroid function controls fertility and menstrual regularity. If you’ve been having trouble getting pregnant, if you have irregular periods, think you are not ovulating, or have had a miscarriage, have your thyroid function checked BEFORE you get pregnant to make sure your levels are optimal. 6. Optimal thyroid functioning is also essential for the healthy development of your baby’s brain. Pregnant women with hypothyroidism automatically need to have their thyroid hormone medication increased by 50 percent in the first trimester to support the increased metabolic needs of the baby. Make sure to talk with your midwife (who might not know this! ), or your primary care doctor or obstetrician who might not remember to adjust your medication dose. 7. Having a hard time losing weight? Tuning up your thyroid gland will rev up your metabolism and burn calories without you having to do anything extra. If you’ve tried diet after diet, exercise program after exercise program without success, it might be time to tap into the root causes — and hypothyroidism might just be one of them. 8. Thyroid glands need nourishment!Make sure your diet and your daily supplement provide you with iodine, selenium, and zinc which are three key nutrients needed by the thyroid gland for basic functioning. Sea vegetables such as 1 tablespoon of dulse flakes daily provides you with a nice dose of iodine, just 1-2 Brazil nuts each day provide you with ample selenium, and zinc is found in beef, oysters, dark meat chicken, cashews, pumpkin seeds, almonds, yogurt, and many other sources. 9. Fluoride, bromide, and chloride coming from your diet, fluoridated water, toothpaste, or other environmental exposures, can interfere with the iodine your thyroid needs to function. (7) If you are having a hard time regulating your thyroid function, even with medications and a supportive doc, look for sources of these in your life and try to reduce/eliminate exposure. 10. In gluten-sensitive individuals, eating gluten-containing foods (wheat, barley, rye) and possibly even some of the gluten cross-reactive foods can cause Hashimoto’s disease. (8, 9) A 3-month trial of going strictly gluten-free might be needed to see if your thyroid antibodies return to normal and your thyroid begins to recover function. Thyroid problems can be fixed! I help women to achieve healthy thyroid function in my practice every day. In most conventional medical practices, you may have to advocate for yourself in the doctor’s office to get the testing you need. A functional medicine, integrative medicine, or naturopathic doctor will usually automatically be willing to test the whole gamut of thyroid tests for you. You have to be careful not to get over-diagnosed and unnecessarily treated if you don’t actually have a thyroid problem; however, if the symptoms and the labs fit — then appropriate treatment can make you feel like a million bucks! Sometimes thyroid function can be recovered and restored with natural methods using stress reduction, diet, herbs, and supplements. Sometimes medications are needed long-term. But either way, it is important to identify whether you have a thyroid problem so you can get the help you need to feel like yourself again. Aviva Romm, MD is a Yale-trained, Board Certified Family Physician and author specializing in natural medicine for women’s and children’s health. She practices with Dr. Mark Hyman at The UltraWellness Center in Lenox, MA.